Trail Mix-Up was the third and final Roger Rabbit cartoon, released with Disney/Amblin's A Far Off Place on March 12, 1993. 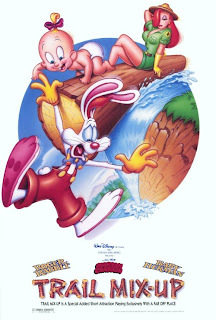 By now the relationship between Disney and Amblin had soured and the next short cartoon, Hare In My Soup, had been cancelled. 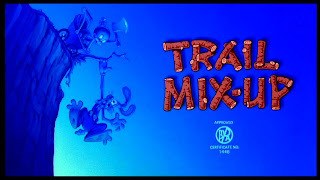 The movie Trail Mix-Up was in front of, A Far Off Place, also does not seem very memorable to me - so this short I did not see in theaters. In Disney's MGM studios however, they did play this while you waited in line for the back lot tour. 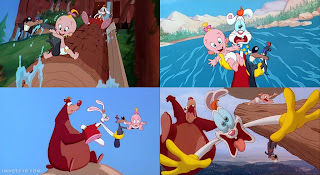 The short starts out as usual: Roger Rabbit, Baby Herman and Mrs. Herman are at the park and Mrs. Herman decides to leave her baby in Roger's care. This short also features a lot more jokes by the animators. 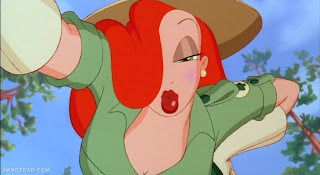 They even threw in a "hidden Jessica" into Roger's tail. 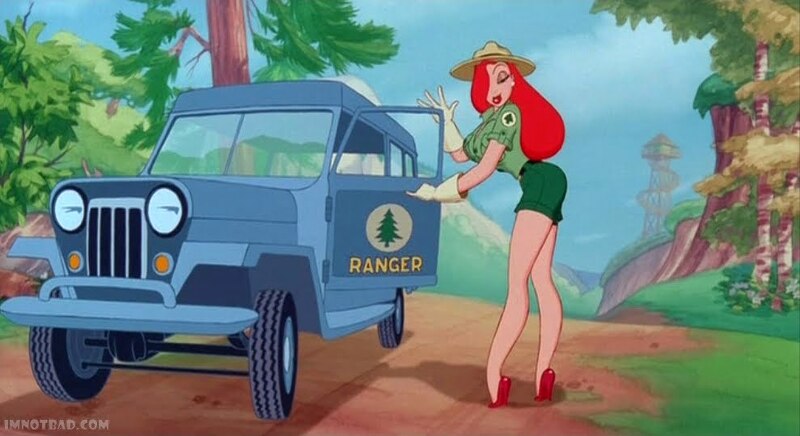 Jessica herself is brought in earlier than the other two films - and is dressed as a Park Ranger. While she is checking on Roger and Baby Herman's safety, Roger drools all over himself while getting an eyeful of Jessica. We are treated to a stunning and bountiful closeup of Jessica, and her appearance here has much more of a presence than Tummy Trouble - while having more lines than in Rollercoaster Rabbit. 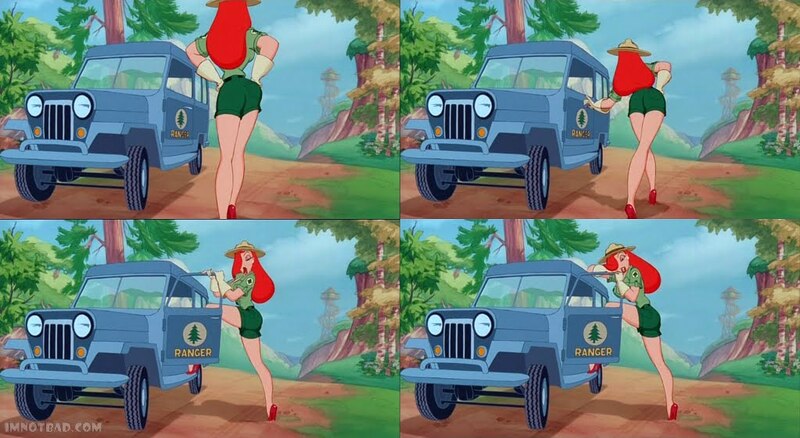 While Jessica walks back to her jeep, she states the famous Smokey the Bear line, "Remember, only YOU can prevent forest fires." The rest of the cartoon is the usual insane chase after Baby Herman, this time landing Roger in the dangerous Saw Mill. Baby Herman follows a beaver inside (which he mistakes for a dog) and Roger attempts to rescue him. 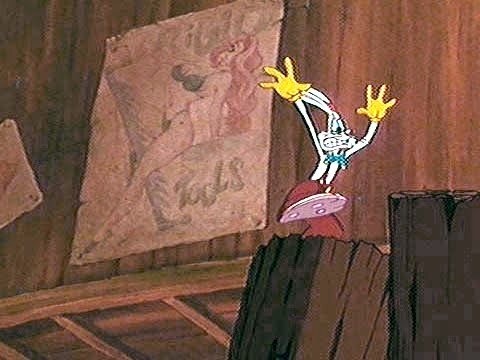 In one scene as Roger running on top of logs in the mill, he passes by a poster which reads "Rigid Tools" and has a picture of what looks like Jessica straddling a hand saw! The version is on the early VHS tapes, but was blurred out in the Special Edition DVD. As Roger, Baby Herman and the beaver go sliding down the log flume, a bear is peacefully fishing and gets brought into the craziness. 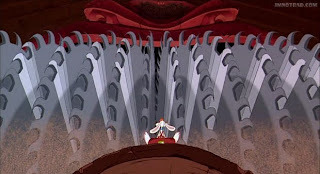 It ends with all four characters exploding out of the cartoon and into the real world - only to crash right into Mount Rushmore. This was a great cartoon and it was nice to see Jessica with a bigger part. The live action segment did not really include interaction with people, and the landscape looked as if it were small scale models - but I think there was to be more focus on the characters in the next cartoons, and judging from the use of Jessica prominently in all three posters in spite of her small role I assume she would could have had more screen time as new cartoons were created. 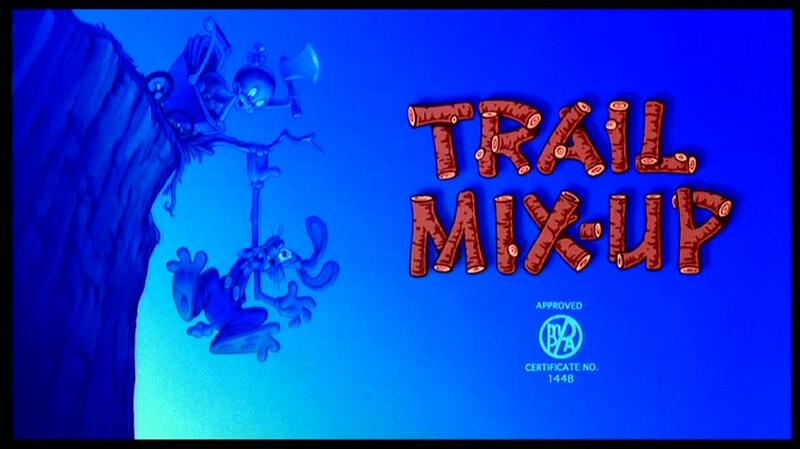 All three shorts can be found on the Special Edition DVD released in 2003.